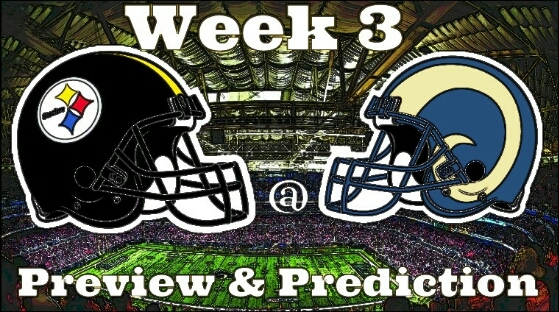 Steelers @ Rams Week 3 Preview and Prediction | "IT'S A STEELERS WORLD"! The Pittsburgh Steelers(1-1) head into Edward Jones Dome September 27th to take on the St. Louis Rams(1-1), in what is looking by most to be a walk in the park. But the Rams lack of consistency taking down the Seattle Seahawks in Week 1, only to choke against a beatable Washington Redskins seems all to familiar for the Steelers as well last season. Sure, Le’Veon Bell returns this Sunday. Sure, St. Louis has the 30th ranked run defense in the National Football League. And although I believe that Bell, along with DeAngelo Williams will produce big..overlooking the Rams is not a wise decision for the team or us fans. The overlooking of mediocre teams is what doomed the Steelers early on in 2014. We are still looking at a Rams team that is ranked 2nd in quarterback sacks, giving the Steelers Offensive line much more work to do in keeping Ben Roethlisberger upright. Something they, and Ben himself did an amazing job of doing last Sunday versus the San Francisco Forty-Niners, and something I am sure they will do once again this Sunday in St. Louis. Although the excitement and anticipation are high regarding Bell’s return to the lineup, the former Michigan State product will get no breaks once he returns, as he’ll have to face off with one of the best front sevens in football in St. Louis. Led by Aaron Donald, Robert Quinn, Chris Long and James Laurinaitis, the Rams front seven is a fearsome opponent. However, they have yet to face Bell since he came into the league in 2013, which makes this matchup even more exciting to watch. Not saying that Steelers Nation/World should not be excited about this game..especially after the dismantling of the 49ers in week 2, just saying that the Rams should be looked upon as a contender. Because just like every other team in the National Football League..they are all professionals, and they want to advance to 2-1 just as much as we do. Having said that, the Steelers running will be too much for the Rams lackluster run defense. And Roethlisberger will be able to avoid the St. Louis quarterback pressure on blitzes by dumping short screens to Bell often. No QB/RB duo do it better than Ben and Bell. Not to mention there is no one that will stop the receiving corps as well. Antonio Brown will definitely pull his own weight as usual.